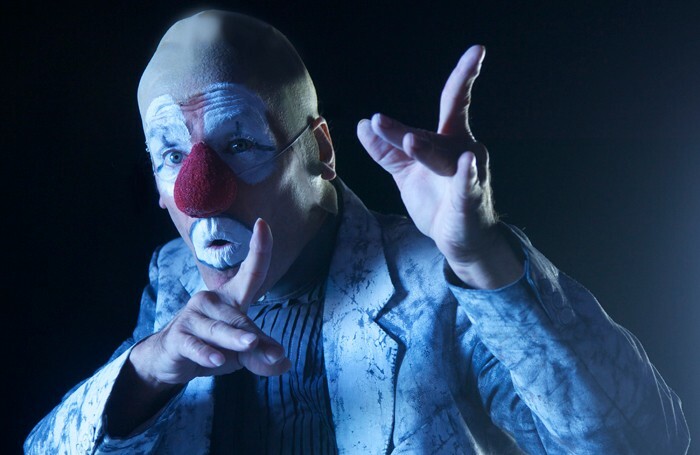 Chris Lynam explores the underbelly of a clown’s fading career. Glumly he makes himself up, interrupted by hi-tech animations of himself that flutter about along with butterflies and musical instruments, as if the whirling thoughts in his head have taken on a life of their own to remind him of what he once used to be. At first he rails against it all, resorting to the tools and tricks of his trade to dispel them, such as using a blunderbuss to fire at the butterflies with comically disastrous results. Realising that it is none of their fault, he slowly turns to celebrating his past – with similarly disastrous effects. Achingly beautiful and seriously funny for all its grimness, this is a highly-structured, well-designed technical show, and yet Lynam’s true brilliance is that he is always there in the moment, contemporary in every way. Sensitively guided by director John Wright, this creates a tension in two ways: where Lynam’s emotions find a natural, human resonance in the audience despite the faded gothic artifice of the staging, while he also retains the ability to improvise, to respond to the reactions he creates in that audience. Ericthefred is an entrancing opportunity to watch that process at work and to follow its consequences as the drama unravels. What it lacks, however, is a third act and the wrapping up at the end feels premature and hurried.